Simona Ventures starts its debut as a VC focused on startups encouraging business and initiative to bring out social mission related to gender gap. Currently, the company is having fundraising up to $5-10 million (around Rp71 billion-Rp142 billion). Simona Ventures Managing Partner, Putri Izzati said, the early stage startups will be in Indonesia, to penetrate Southeast Asia to Asia Pacific. The number is around $50 thousand (711 million Rupiah) up to $200 thousand (2.48 billion Rupiah) per startup, including co-investing with the other investors. The fundraising is expected to be finalized by early semester II/2019. “We’re still in the process to find potential LP, either local or overseas. In fact, to invest in this segment, there will be trust issue, to invest in women empowering will have broad impact. Not only profit, but also social,” she explained (3/19). Simona’s commitment in this segment is quite challenging, moreover, there’s not enough investors specifically care for gender gap and female empowerment, either Indonesia or global. Also, it’s lack of female founders. As we take the shortest example from unicorn startups in Southeast Asia, female founders or those having role at decision maker level aren’t so many. In fact, he continued, decision maker that comes from various background should provide better solution for a startup. Thus, the company will gain benefit in terms of business. In addition, since Putri started her first career in the IT industry in 2011, this issue isn’t really significant. Although, Indonesia is now have different condition. Simona will discover startups with enough diversity in team, product with solution to challenge related to gender gap, and not only technology. Moreover, they’re expected to have business and receive funding. 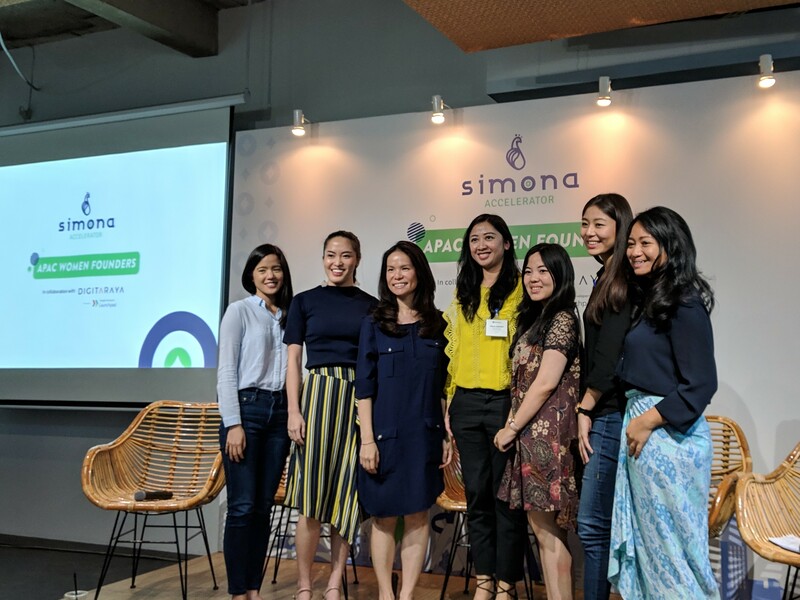 In its debut, Simona Ventures collaborates with Digitaraya to hold the APAC Women Founders Accelerator Program. The company has selected 11 startups led by female from countries in Asia Pacific region. 1. Avana (Malaysia): handling micro business using transaction in social media, through automatic tools and business intelligence. The business player can sell products online on various channel, and transform the social media which was only for promotion to transaction platform. 2. Fuse (China): a platform that integrates O2O and optimizes offline retail solution with e-commerce. Through Fuse, business can identify consumer’s habit offline to increase store sales conversion. 3. Gadjian (Indonesia): a cloud-based app for management and employees payroll. Gadjian provides an accurate data to optimize HR division, particularly for tax and payroll. 4. Glazziq (Thailand): an e-commerce platform selling glasses products online at two to three times under the usual price. 5. Kono (South Korea): AI based assistant to help company create meeting schedule to save time and help employees to meet more customers, merchants, and partners. 6. PolicyPal (Singapore): an insurance app that offers one-stop solution for distribution, management, and insurance claim through AI and blockchain technology. This startup graduated from MAS Fintech Sandbox in Singapore and acquire insurance broker license. 7. Roshni Rides (Pakistan): a woman-friendly carpooling platform for those routinely in need of comfortable vehicle. 8. Seekmi (Indonesia): app and web solution that connects local provider with customers from blue collar. 9. Snooper (Australia): a crowsourcing app that provide incentives for buyers by collecting data from various stores to be analyzed. The data is accessible through dashboard and real time. 10. Stylegenie (Philippines): a private stylist to help customers mix and match using the data providee by retail brand. 11. ViralWorks (Vietnam): a space connecting brand and marketers to the influencers bn for potential monetizing, for social media users with dozens of followers. Supported by the algorithm to create an effective target market. All participants will join the accelerator program for five days, starts from bootcamp and immersion from 25-27 March 2019. Demo day starts on the next day. In March 29th, 2019 will be a time for 1-1 meeting with mentors or potential investors. Speakers and Mentors come from experts and industry players, among those are McKinsey & Company Indoonesia, Danone Indonesia, Google, Blue Bird Group, Sintesa Group, Go-Jek, Patamar Capital, UBS, and Kominfo (Communication and Informaticsh Ministry) representative. “As a startup accelerator in Indonesia, we’re aware of the challenge of female in startups. To date, only 10% startups in our program with female co-founder or C-level executives,” Digitaraya’s VP strategy, Nicole Yap said.